The Vivo S1 is a great smartphone in the mid-range price segment. The cameras are great to capture quality images and also can record quality videos. It has a good configuration that assures a flawless performance. The device also comes with a good battery backup and massive storage. Overall, the Vivo S1 is one of the best options to g for around this price range. The Vivo S1 flaunts a 6.53-inch IPS LCD display, which has a pixel density of 395 PPI. It results in a screen resolution of 1,080 x 2,340 pixels. Acting as the stamina provider, there is a 3,940mAh Li-ion battery, which provides long hours of backup. It also comes with a fast charging technology, which refills the battery in a short time. The Vivo S1 is armed with a triple camera setup consisting of 12MP, 8MP, and 5MP lenses. The cameras can click excellent images and also can record quality videos. At the front, there is a 25MP selfie shooter that also helps while facilitating video calls. The device has a wide range of connectivity options such as 4G with VoLTE, mobile hotspot, Bluetooth, GPS, microUSB and Wi-Fi. The Vivo S1 comes with a 128GB inbuilt storage, which helps to store a lot of files and documents in it. The storage can be further expanded up to 256GB by using a memory card. The smartphone has two quad-core processors under the hood as 2.1GHz Cortex A73 and 2GHz Cortex A53. The processors manage the overall performance of the system and are seated on a MediaTek Helio P70 chipset. These are accompanied by a 6GB RAM that makes handling multiple tasks easy. In addition, there is a Mali-G72 MP3 GPU that takes care of the graphical needs. Vivo S1 price in India is expected to be Rs. 23,590. Vivo S1 Expected to be launched on Jun 20, 2019. 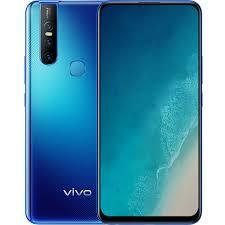 This is 6 GB RAM / 128 GB internal storage variant of Vivo which is expected to available in Pet Powder, Ice Lake Blue colour.